Completely natural-source B vitamins are available in Max Stress B Nano-Plex derived from proprietary technology using special, healthy strains. 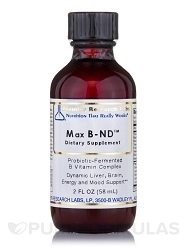 Max B-NDTM is a nutritional industry first - with never before available probiotic-fermented B vitamins. This product contains a high-energy B vitamin complex that delivers premier nutritional support. Each 1/2 tsp. supplies high energy vitamin B forms including B5 as pantothenic acid, vitamin B2 in the riboflavin-5-phosphate form and more. This B vitamin-rich formula offers advanced support for the liver, the immune system, adrenal glands, mood balance and energy levels. 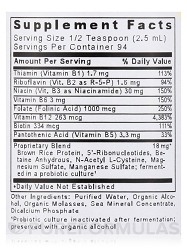 Brown rice protein‚ 5'-ribonucleotides‚ betaine anhydrous‚ n-acetyl l-cysteine‚ magnesium sulfate‚ manganese sulfate; fermented in a probiotic culture. 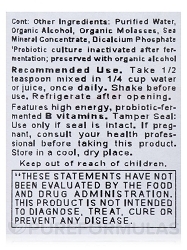 Other Ingredients: Purified water‚ organic alcohol‚ organic molasses‚ sea mineral concentrate‚ dicalcium phosphate.